http://cinziamazzamakeup.com/?x=vardenafil-originale-20-mg-prezzo Miss Emma has been a busy girl since we got back from Boston in January. We are excited to share some good news with everyone who continues to follow Emma’s story and support us. Emma has been working SO hard at therapy. In fact she was the Star Patient this month at PTC where she goes to therapy. It was so nice that her therapists recognized all of her hard work and progress she has made this past year. Emma got new AFOs, which are braces for her feet that give her extra support last week. She had already outgrown the ones we got this summer, so we are happy to once again have AFOs that fit. Emma does so much better walking with them. The most exciting news is that we FINALLY got her walker on Friday. We have been waiting since November for her walker to get here, and are thrilled that it is here. This means that we can have her own walker that she can use at home to practice walking whenever we want. Yay!!! Emma looks awfully proud whenever we put her in the walker and it is so fun to see that look on her face. I hadn’t really thought about it before we got the walker home, but Aiden had never seen her walk with a walker before because she had only done it at therapy. The first time we put her in the walker at home, Aiden came running up yelling, "Emma is walking, Emma is walking!!" He was so proud of her, and it absolutely melted my heart. 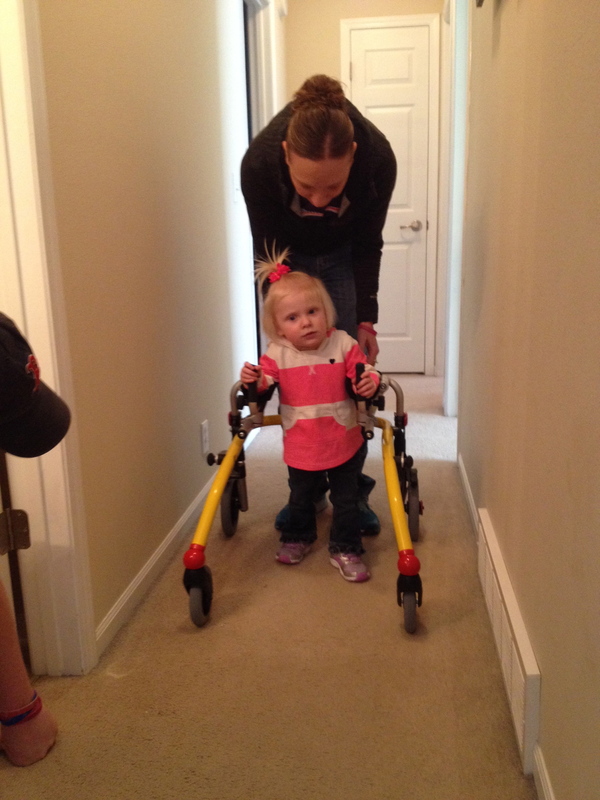 We are hoping that this walker will be key in helping to teach Emma how to walk by herself. Today at therapy Emma walked over 200 feet without a break in her walker. Way to go Emma! Emma has also been working hard on learning to drink better from a cup and a straw. She can now take sips from both and has been taking more fluids from a cup the last week or so. Emma also continues to make nice progress on her language, and we continue to notice her adding new words to her vocabulary. All of Emma’s hard work at therapy is paying off! click here Emma has continued her chemotherapy and has continued to tolerate it pretty well. The protein in her urine has been around 100 the last two times she has had chemo, so we continue to watch and monitor that. Emma had a follow-up eye doctor appointment yesterday. Dr. Legge had talked about the possibility of doing botox injections in her eyes to help her eyes learn to function together better. This would help her to not favor one eye over the other which can cause problems later on. We were expecting that he would say we needed to move forward because the optimal time to this treatment is by age 2. We were pleasantly surprised when he said he felt that her eye movement seemed to have slightly improved. He decided to continue patching her right eye for an hour each day and come back again in 6 weeks to see if he continues to see progress. Dr. Legge said it could be that patching is helping and she has naturally improved on her own, or it could have just been some natural fluctuation. He said we should be able to tell in 6 weeks which it was and then decide for sure what to do. If her eyes continue to improve on her own we wouldn’t need to do the botox injections, but if it appears that is was fluctuation then we will need to consider doing the injections this spring so that we get it done by her 2nd birthday. viagra generico 50 mg italia pagamento online a Roma Continuing on with the positive news we have moved forward with our mission to raise funding for Brain Tumor Research this year. We can now announce that there are already two events scheduled to help us raise funds 100% of which will go to Research. Emma is going to be putting on an "EmmaStrong Charity Golf Tournament" to be held on her 2nd birthday May 24, 2014 at Tiburon Golf Course. May happens to be Brain Tumor Month, so it seems as though we didn’t have much choice on what day to schedule the event. We have already met with the golf course and am currently working on putting a brochure together to share with the world. We know that some of you will be asking what you can do to help. The biggest thing that I am looking for is teams of four to come out and golf with us. I will be out and about looking for businesses to help sponsor holes, golf carts, meals etc. So if you know of someone wanting to help we will be more than happy to stop by. The paperwork for this event will be on EmmaStrong.com in the near future. real cialis online For those of you that attended and took part in the EmmaStrong Fun 5k Run/Walk held in Kearney last June, we are excited to announce it will be around for another year. Some of our very close friends have set the date for June 21st with it again being held on the running trail at Yanney Park in Kearney, NE. I know that at least a couple of the members in our house will be looking forward to getting out and running with friends for a cause extremely close to our hearts. Brent on the other hand still hasn’t recovered from the 3 plus mile run from last year and may be focusing more on the walking part. Registration for this event can be found on getmeregistered.com (click on search for events and type in Emma’s 80’s Fun 5k Run/Walk). I will will also be working on linking this under upcoming events on EmmaStrong.com. follow url It has been nice to have a little good news the last week and has been so wonderful to see Emma continue to make progress in therapy. We are so proud of her and all of her hard work!! Thanks again for all of your continued support!